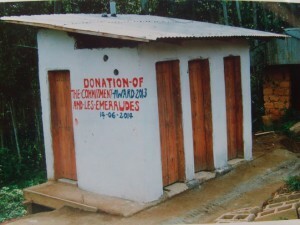 Many schools in the rural areas of Cameroon lack basic sanitation facilities. This is no longer the case for the Ecole Publique de Batotcha I in Bansoa, a village in the western region of Cameroon. With the help of the newly build Ventilated Improved Pit Latrines (VIPL), the risk of diseases such as Cholera, diarrhea and worms has been greatly decreased for 3.000 students! These are diseases that not only threaten the health and well-being of schoolchildren, but which also prevent them from attending school on a regular basis. Besides that, in two years time these dry toilets will also start providing compost, which can be used to fertilize the surrounding fields. The video below shows the production process of these toilets, but unfortunately does not include the dances with “peace trees” that the students performed to express their gratitude for these new latrines.